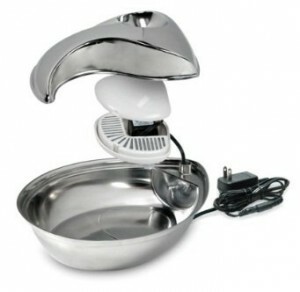 Today I want to give you a quick review of – no nothing almost paleo – but my kitties Pioneer Pet Raindrop Oval Stainless Steel Fountain. I am sure many of you have pets and want the best for them. They are family members to us. So making their life as wonderful as possible comes natural. 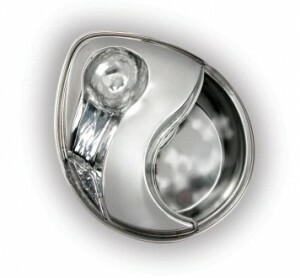 That is why we bought our kitty a Pioneer Pet Stainless Steel Fountain Raindrop Design , 60oz . She loves her dry kibble – yes I know, it is not healthy, but she is the one cat in the world that would starve herself instead of eating wet food. We get some appetizers and pouches of wet food into her, but she insists on kibble. So we buy her kibble that is grain free, corn free and has no artificial colors or flavors. We tried Fresh Pet, but she only eats once and then she ignores it. We tried tuna, salmon and whitefish when we order sushi – and that she eats once. But not a second time. We giver her raw organic ground beef when we eat beef tartar, but again she only eats it when we are eating it, and not a second time when we give it to her later. So by eating mainly dry food, she needs to drink lots of water. So a kitty fountain was the best idea. This is a review that is also on Amazon, because people have trouble with their fountain being to noisy or plain stop to work. We bought this fountain about 2 years ago. We just adopted our new kitty and she was drinking out of the plastic food/water dual bowl. I really did not like that bowl, but that came with her when I picked her up from her foster parents. on Amazon and after reading many reviews, we decided to give it a try. When I got the box I assembled the fountain and filled it up to where it was suggested. I had placed the fountain on a mat you use to clean your shoes off, but the fountain was kind of noisy. So I checked it and started turning it. It got a little bit more quiet, but still – the noise was there. So I went and got more water and filled it up just a little bit above the rim – it does not overflow the way I have my settings on the motor. My cat likes a gentle flow, so it worked perfectly. Once I filled the water higher the noise was gone. No more noise, completely quiet. As long as I keep the water filled, I have no noise problem. Fast forward about a year – I was cleaning the fountain and after I put it back together and filled it with water, the motor did not want to start. No matter what I tried, it did not start. I thought maybe it had died. So I went back to disassemble the fountain and disassemble the motor. I always did that, but I did not realize that I had to clean out the opening on the motor assembly and take out the magnet. Once I had cleaned the spout of the motor and cleaned the inside housing of the magnet, the motor ran like a charm. Now I clean my fountain 2 times a week, including disassembling the motor completely. I did order a second motor just in case, but as long as I clean it out, I don’t need the new one. Now, I do not like to waste anything and throwing the filter cartridges away seemed such a waste. So about 4 months ago I bought Activated Carbon you use in your fish tanks and a piece of non-woven white pad, also for aquarium filters. I then disassembled one filter cartridge. I made myself a template to cut the pads. I then put one pad on the bottom, a spoon of Activated Carbon, and another pad on the top – rinsed for 2 minutes under cold water and put it into the fountain housing. It works like a charm. Besides not having to throw out the cartridges, I now save money too. The pad and carbon will last me for another 2 years, and I am sure the fountain will too. Following these steps has kept my fountain running quiet and smooth, with no problems. Thanks everybody for bearing with me.